Keep your perishable inventory safe with the Bottom Mount Single Door Refrigerator. This space-saving refrigerator measures 27” wide and provides 21 cubic feet of space. Open the door past 90° and it stays open for easy stocking or rotation, open less than 90° and it self-closes. You'll have all the space your kitchen requires with the 3 adjustable shelves measure 20-9/10"x 24-2/5" and can hold 88 lbs. per shelf. The temperature range of 33°F - 45°F can be adjusted and monitored from the digital temperature control on the units exterior. 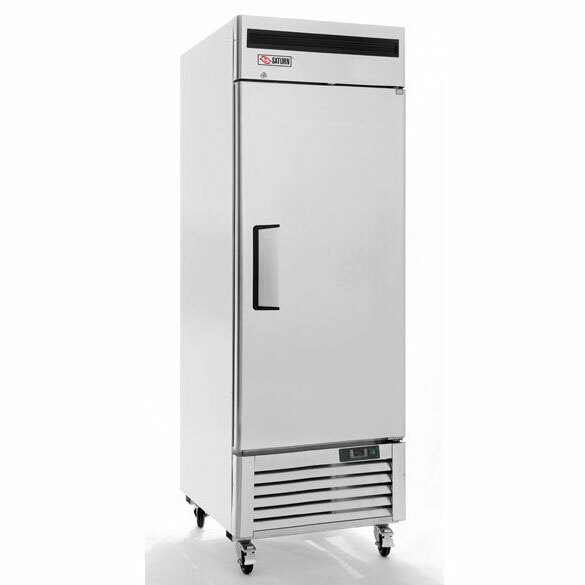 More features include stainless steel construction to ensure durability, a recessed door handle for an ergonomic grip, heavy duty factory mounted casters, interior lighting, standard door locks for loss prevention, and high-density insulation makes this unit energy efficient.